In March 2019, ICRANet has prepared an important press release on the Supernova breakout in the BdHN GRB 190114C, which will be sent out for publication. On January 14, 2019, GRB 190114C was announced by the team of the Swift satellite (GCN 23688). Its distance (redshift z=0.42) was determined a few hours later by the Nordic Optical Telescope located at the Canary Islands – Spain (GCN 23695). Soon after we recognized that this source was a BdHN I, ICRANet sent the GCN 23715 (see full text below) anticipating the possibility of the appearance of an associated Supernova. The Supernova was indeed detected at the exactly predicted time, as reported by A. Melandri et al. on 19 March 2019 (GCN 23983). We herby illusrate the relevance of this ephocal observations, by evidencing the universal role of the Supernova mass both in BdHN I and BdHN II. The detection and follow-up of GRB 190114C has been made possible thanks to a worldwide effort of many satellites and telescopes with a very strong participation of Italy through the International satellites Swift (NASA-DOE mission with the participation of Italy and the UK) and Fermi (NASA-DOE mission with the participation of ASI, INFN and INAF), and with the Italian satellite AGILE. Specifically, this GRB has been observed in the X-ray and gamma-ray energy domain by the satellites Swift, Fermi, AGILE, INTEGRAL, Insight-HXMT/HE (a Chinese X-ray satellite of IHEP, Tsinghua University-China), Konus-Wind (Russia); also, in the highest gamma-ray energy domain by Fermi-LAT (USA and Italy) and the MAGIC telescopes, located at the Roque de los Muchachos Observatory, Canary Islands – Spain (with the collaboration of institutions in Germany, Armenia, Bulgaria, Croatia, Finland, Italy, Poland, Spain and Switzerland); finally in the optical domain by the telescopes MASTER-IAC (Russia), Pan-STARRS (Haleakala Observatory, Hawaii - USA), the Nordic Optical Telescope-NOT, located at Canary Islands – Spain (owned by the Nordic Optical Telescope Scientific Association, and funded by Denmark, Finland, Iceland, Norway and Sweden), MPG+GROND (La Silla Observatory, Chilean Atacama Desert-Chile), GCT+OSIRIS (Canary Islands - Spain), Osservatorio Astronomico S. Di Giacomo (Agerola - Italy), VLT+FORS2, the NTT+EFOSC2 and the REM+ROS2 at the European Southern Observatory - ESO (Chile), the TNG+DOLORES (INAF), the LBT+MODS2 (INAF) located at Mount Graham (Arizona - USA), the WHT+ACAM located at the Roque de los Muchachos Observatory (Canary Islands - Spain), McDonald Observatory (USA), SNU Observatory (Seoul - South Korea), AZT-33IK located at the Sayan Observatory (Russia), LSGT at the Siding Spring Observatory (Australia), GROWTH-India telescope at the Indian Astronomical Observatory (India), KMTnet in the South African Astronomical Observatory (South Africa), UKIRT, RC-1000 of the CHILESCOPE Observatory (Chile), HCT located at the Indian astronomical observatory (India), COATLI and the Harold Johnson Telescope at Osservatorio Astronomico Nacional on the Sierra de San Pedro Martir (Mexico), RTT150 at the TUBITAK National Observatory (Turkey); in the radio band domain by the Karl G. Jansky Very large Array (VLA), the Atacama LargeMillimeter/Submillimeter Array (ALMA), the Australia Telescope Compact Array (ATCA), the Sardinia Radio Telescope (INAF), the MeerKAT radio telescope (South Africa) and the Giant Meterwave Radio Telescope – GMRT (India). ICRANet has been following the study of GRBs since the earliest discovery time to the latest observations by a theoretical analysis, which has led, among others, to the classification of all GRBs in nine different subclasses. Binary driven Hypernovae (BdHN) are the most numerous of such subclass. Their progenitor is a binary system composed of carbon-oxygen (CO) core and a magnetized neutron star (NS) companion in a very compact orbit of binary period of the order of minutes. 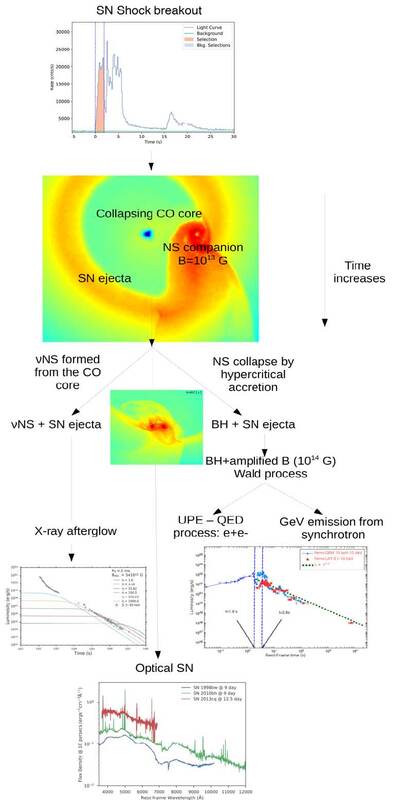 The CO core collapses at its center forming a new NS (νNS), but the external layers are ejected in form of a Supernova (SN) explosion, see figure enclosed. The SN ejecta produces a massive and rapid accretion process onto the NS companion leading to its gravitational collapse forming a black hole (BH). Meanwhile, the Supernova ejecta continues to expand but still matter remain around of both the νNS and the BH. The background magnetic field (B) collapse, together with the rotation of the BH, triggers the “Wald” process by which an electric field is induced. This E-field explains both the ultra relativistic prompt emission phase (UPE) in the gamma-rays through the transparency of the self-accelerating electron-positron pair plasma created by quantum electrodynamic process of vacuum breakdown, and the GeV emission through synchrotron emission of accelerated protons in the B-field. The interaction of the νNS pulsar emission with the SN ejecta explains the X-ray afterglow. Finally, after about 15 days, the optical emission of the SN produced by the energy release of the decay of Nickel, is observed. Truly exceptional is that all phases of the BdHN starting from the onset of the SN break-out, to the accretion process, to the moment of formation of the Black Hole, to the observation of the GeV emission and afterglow to the final identification of the optical Supernova have become observable with enormous precision in this most unique source. GRB 190114C with T90=116 s (50-300 keV), Epeak = 998.6 +/- 11.9 keV, isotropic energy release in gamma-rays Eiso = 3 E53 erg, and the isotropic peak luminosity Liso = 1 E53 erg/s (R. Hamburg et al., CGN 23707) presents the typical characteristics of type I binary-driven hypernova (BdHN) (Y. Wang et al., submitted to Astrophysical Journal arXiv:1811.05433v2). The most significant ever Fermi-LAT GeV emission (D. Kocevski et al., GCN 23709) with test statistic value TS>2500 implies that this GRB is seen from the normal to the orbital plane of the progenitor binary system composed of a carbon-oxygen core and a neutron star companion (R. Ruffini et al., submitted to Astrophysical Journal arXiv:1803.05476). The TeV emission (R. Mirzoyan et al., GCN 23701), a first in GRBs, has been recently predicted, as originating from the Wald solution, within the new inner engine approach of the long GRBs recently introduced in Ruffini et al (submitted to Physical Review Letter: arXiv:1811.01839) and Ruffini et al (submitted to Astrophysical Journal: arXiv:1812.00354). Most interesting this system being at z=0.4245 (A. J. Castro-Tirado et al., GCN 23708), can give a strong support to our BdHN approach by Observing a Supernova. Using the averaged appearance time of the SNe associated to GRBs (Cano et al., 2016), and considering the redshift z=0.42 (J. Selsing et al., GCN 23695, A. J. Castro-Tirado et al., GCN 23708), a bright optical signal will peak at 18.8 +/- 3.7 days after the trigger (February 2nd 2019, uncertainty from January 30th 2019 to February 6th 2019) at the location of RA 54.510 and DEC -26.939, with an uncertainty 3 arcmin (J.D. Gropp et al., GCN 23688). The follow-up Observations, especially the optical bands for the SN, are recommended. We report the discovery of the supernova associated with the gamma-ray burst GRB 190114C (Gropp et al., GCN 23688) at z=0.42 (Selsing et al., GCN 23695; Castro-Tirado et al., GCN 23708; Kann et al., GCN 23710). An observational campaign lasting about 50 days has been carried out with the VLT+FORS2, the NTT+EFOSC2 and the REM+ROS2 at the European Southern Observatory (Chile), the TNG+DOLORES, the LBT+MODS2 located at Mount Graham (Arizona), and the WHT+ACAM located at the Roque de los Muchachos Observatory (Canary Islands). These observations show, at about 15 days after the burst, an apparent flattening of the afterglow light curves, in the i and z filters, in excess of the host galaxy flux, as measured in our latest epochs. This is the consistent with the emergence of a SN associated with GRB 190114C, as observed in several previous events. By modelling the overall light curve between 0.01 and 15 days after the burst trigger (including also data from GCN circulars) with a broken power-law (afterglow contribution) + constant (host galaxy contribution), the residual fluxes in the observed i and z bands show a peak of brightness of ∼23.9 and ∼23.5 mag (AB), respectively. With these values we derive an estimate for the rest frame visual absolute magnitude of the SN associated with GRB 190114C of about -18 mag. This value is about 1 mag fainter than SN 1998bw (Patat et al. 2001, ApJ, 555, 900). However, the two SNe could have a comparable brightness considering the significant extinction, yet to be quantified, suffered by this event (see e.g. Kann et al., GCN 23710). We caution that the reported values for the SN peak brightness strongly depend on the modeling of the temporal behavior of the overall light curve. Further photometric and spectroscopic analysis is ongoing. We thank the VLT, TNG, LBT and WHT staffs for executing these observations. Part of these data have been obtained under the extended Public ESO Spectroscopic Survey for Transient Objects (ePESSTO; see Smartt et al. 2015, A&A, 579, 40; http://www.pessto.org). The Scientific and Technical Subcommittee of the Committee on the Peaceful Uses of Outer Space (COPUOS) held its fifty-sixth session at the United Nations Office at Vienna from February 11 - 22, 2019. Professor Ruffini took part to the side event panel "Progress on the technical development and on the establishment of the Open UNiverse initiative: Space science data for everyone", organized by Paolo Giommi, Senior Scientist and coordinator of the Open UNiverse initiative at the Italian Space Agency (ASI). In this side event, the Open UNiverse initiative was presented, together with its principles, objectives and advantages. It gives us great pleasure to announce the Armenian-Italian Science Day event "Joint ICRANet activities in Relativistic Astrophysics", a one day conference which will take place in Yerevan on April 15, 2019. The event will be held in the National Academy of Sciences both in Armenian and in English, and has been organized thanks to the collaboration among ICRANet, the National Academy of Sciences of Armenia (NASRA) and the Italian Embassy in Yerevan. Institutional representatives from Armenia and from several other countries will be present and address the morning session. After lunch, there will be a series of conferences by eminent Professors and researchers, who will illustrate the most recent scientific developments on which ICRANet is working on. You can find more details about the event on our webpage: http://www.icranet.org/Armenian-ItalianScienceDay). It gives us great pleasure to announce the Open Universe International Doctoral School on "Magnetized Black Holes, GRBs, AGNs and the most violent Universe: from observation on data acquisition to the theory and model-building of GRB 190114C", a 4 days conference which will be held from June 10 - 14, 2019 in the ICRANet Seat at Villa Ratti (Nice - France). It has been organized thanks to the collaboration among ICRANet, LAPP (Laboratoire d'Annecy de Physique des particules) and the Max Planck Institute for Physics. The scientific program is under preparation, and more details about the event will be published on our webpage soon. It gives us great pleasure to announce the 16th Italian-Korean Symposium on Relativistic Astrophysics, that will be held at ICRANet center in Pescara from July 1 - 5, 2019. The Italian-Korean Symposia on Relativistic Astrophysics is a series of biannual meetings, alternatively organized in Italy and in Korea since 1987. The symposia discussions cover topics in astrophysics and cosmology, such as gamma-ray bursts and compact stars, high energy cosmic rays, dark energy and dark matter, general relativity, black holes, and new physics related to cosmology. The scientific program is under preparation, and more details about the event will be published on our webpage (http://www.icranet.org/ik-meetings) soon. 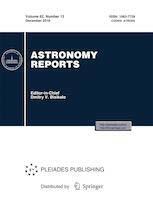 The proceedings of the Third Zeldovich meeting, held in Minsk (Belarus) on April 23 - 27, 2018, have been published by Springer in Astronomy Reports, Volume 62, Issue 12, December 2018 (see: https://link.springer.com/journal/11444/62/12/page/1). The special editors of this volume are Professors Remo Ruffini, Sergei Kilin and Gregory Vereshchagin. The preface of the editors can be found here. - N. I. Shakura, "Ya.B. Zeldovich and Foundation of the Accretion Theory", pages 823-833. - G. Aksenov, V. M. Chechetkin, "Supernova Explosion Mechanism with the Neutrinos and the Collapse of the Rotation Core", pages 834-839. - L. Becerra, C. Ellinger, C. Fryer, J. A. Rueda, R. Ruffini, "On the Induced Gravitational Collapse: SPH Simulations", pages 840-846. - K. Boshkayev, "Equilibrium Configurations of Rotating White Dwarfs at Finite Temperatures", pages 847-852. - Y.-C. Chen, C.-Y. Hwang, "Morphology of Seyfert Galaxies", pages 853-858. - M. Demiański, A. Doroshkevich, "Observations of the Ly-α Forest", pages 859-867. - E. Derishev, "Radiation-Mediated Shocks: Kinetic Processes and Transition to Collisionless Shocks", pages 868-873. - G. Fodor, "Localized Objects Formed by Self-Trapped Gravitational Waves", pages 874-881. - M. Galper, N. P. Topchiev, Yu. T. Yurkin, "GAMMA-400 Project", pages 882-889. - M. Hohmann, "Polarization of Gravitational Waves in General Teleparallel Theories of Gravity", pages 890-897. - Krut, C. R. Arguëlles, J. Rueda, R. Ruffini, "Galactic Constraints on Fermionic Dark Matter", pages 898-904. - R. Moradi, R. Ruffini, C. L. Bianco, Y.-C. Chen, M. Karlica, et al., "Relativistic Behavior and Equitemporal Surfaces in Ultra-Relativistic Prompt Emission Phase of Gamma-Ray Bursts", pages 905-910. - E. A. Panko, S. M. Andrievsky, S. I. Yemelianov, A. M. Stepaniuk, "Regular Substructures in the Rich Open Galaxy Clusters", pages 911-916. - T. Petrushevska, T. Okamura, R. Kawamata, L. Hangard, G. Mahler, "Prospects for Strongly Lensed Supernovae Behind Hubble Frontier Fields Galaxy Clusters with the James Webb Space Telescope", pages 917-925. - M. A. Prakapenia, I. A. Siutsou, G. V. Vereshchagin, "Numerical Scheme for Treatment of Uehling–Uhlenbeck Equation for Binary and Triple Interactions in Relativistic Plasma", pages 926-932. - D. Primorac, M. Muccino, R. Moradi, Y. Wang, J. D. Melon Fuksman, et al., "Structure of the Prompt Emission of GRB 151027A Within the Fireshell Model", pages 933-939. - J. F. Rodriguez, J. A. Rueda, R. Ruffini, "On the Final Gravitational Wave Burst from Binary Black Holes Mergers", pages 940-952. - Rácz, "A Simple Method of Constructing Binary Black Hole Initial Data", pages 953-958. - G. Vereshchagin, S. Bedić, "Loop Quantum Cosmology and Probability of Inflation", pages 959-964. D. Bini, A. Geralico, R.T. Jantzen, Black hole geodesic parallel transport and the Marck reduction procedure, accepted for publication by Phys. Rev. D (2019). The Wigner rotations arising from the combination of boosts along two different directions are rederived from a relative boost point of view and applied to study gyroscope spin precession along timelike geodesics in a Kerr spacetime. First this helps to clarify the geometrical properties of Marck's recipe for reducing the equations of parallel transport along such world lines expressed in terms of the constants of the motion to a single differential equation for the essential planar rotation. Secondly this shows how to bypass Marck's reduction procedure by direct boosting of orthonormal frames associated with natural observer families. Wigner rotations mediate the relationship between these two descriptions for reaching the same parallel transported frame along a geodesic. The comparison is particularly straightforward in the case of equatorial plane motion of a test gyroscope, where Marck's scalar angular velocity captures the essential cumulative spin precession relative to the spherical frame locked to spatial infinity. These cumulative precession effects are computed explicitly for both bound and unbound equatorial plane geodesic orbits. The latter case is of special interest in view of recent applications to the dynamics of a two-body system with spin. Our results are consistent with the point-particle limit of such two-body results and also pave the way for similar computations in the context of gravitational self-force. R. Riahi, S. Z. Kalantari, J. A. Rueda, Universal relations for the Keplerian sequence of rotating neutron stars, published on 11 February 2019 in Phys. Rev. D 99, 043004 – P.
We investigate the Keplerian (mass-shedding) sequence of rotating neutron stars. Twelve different equations of state are used to describe the nuclear structure. We find four fitting relations which connect the rotating frequency, mass and radius of stars in the mass-shedding limit to the mass and radius of stars in the static sequence. We show the breakdown of approximate relation for the Keplerian frequency derived by Lattimer and Prakash [Science, 304, 536, (2004)] and then we present a new, EOS-independent and more accurate relation. This relation fits the Keplerian frequency of rotating neutron stars to about 2% for a large range of the compactness MS/RS of the reference non-rotating neutron star, namely the static star with the same central density as the rotating one. The performance of the fitting formula is close to 4% for MS/RS≤0.05 M⊙/km (fK≤350~Hz). We present additional EOS-independent relations for the Keplerian sequence including relations for MKfK and RKfK in terms of MSfS and RSfS, respectively, one of MK/RK as a function of fK/fS and MS/RS, and a relation between the MK, RK and fK. These new fitting relations are approximately EOS-independent with an error in the worst case of 8%. The universality of the Keplerian sequence properties presented here add to the set of other neutron star universal relations in the literature such as the I-Love-Q relation, the gravitational binding energy and the energy, angular momentum and radius of the last circular orbit of a test-particle around rotating neutron stars. This set of universal, analytic formulas, facilitate the inclusion of general relativistic effects in the description of relativistic astrophysical systems involving fast rotating neutron stars. C.R. Argüelles, A. Krut, J.A. Rueda, R.Ruffini, Novel constraints on fermionic dark matter from galactic observables II: Galaxy scaling relations, accepted for publication in Physics of the Dark Universe (DARK_100278) on January 29, 2019, available online from February 14, 2019. We have recently introduced in paper I an extension of the Ruffini-Argüelles-Rueda (RAR) model for the distribution of DM in galaxies, by including for escape of particle effects. Being built upon self-gravitating fermions at finite temperatures, the RAR solutions develop a characteristic dense quantum core-diluted halo} morphology which, for fermion masses in the range mc2≈10−345 keV, was shown to provide good fits to the Milky Way rotation curve. We study here for the first time the applicability of the extended RAR model to other structures from dwarfs to ellipticals to galaxy clusters, pointing out the relevant case of mc2=48 keV. By making a full coverage of the remaining free parameters of the theory, and for each galactic structure, we present a complete family of astrophysical RAR profiles which satisfy realistic halo boundary conditions inferred from observations. Each family-set of RAR solutions predicts given windows of total halo masses and central quantum-core masses, the latter opening the interesting possibility to interpret them as alternatives either to intermediate-mass BHs (for dwarf galaxies), or to supermassive BHs (SMBHs, in the case of larger galaxy types). The model is shown to be in good agreement with different observationally inferred scaling relations such as: (1) the Ferrarese relation connecting DM halos with supermassive dark central objects; and (2) the nearly constant DM surface density of galaxies. Finally, the theory provides a natural mechanism for the formation of SMBHs of few 108M⊙ via the gravitational collapse of unstable DM quantum-cores. Yen-Chen Chen, Chorng-Yuan Hwang, Emission Line Luminosity Distributions of Seyfert 2 Galaxies, accepted for publication in March 2019 on MNRAS, to be published in May, 2019. We probed the relation between line activities of Seyfert 2 galaxies and their host galaxies. We selected Seyfert 2 galaxies from the Sloan Digital Sky Survey Data Release 10 with redshifts less 0.2. We used the luminosity of the emission lines as indicators of AGN power. We found that the Seyfert 2 galaxies seem to have two populations in the emission line luminosity distributions. We considered the L[OIII]/Lbulge ratio as an accretion rate indicator and found that the two Seyfert 2 distributions seem to have different accretion rates. We found that these two Seyfert 2 populations, although classified by their emission line distributions, turned out to have different morphology distributions. These results indicate that these different populations of the Seyfert 2 galaxies might be significantly different in their physical conditions.